Come but of diverse sightes. Counted it but a trufle. And they held it a high science, to have knowledge of such things. Their science was only a series of sundry observations. And compared with Christian philosophy, a contemptible thing. In William Langland and B. Thomas Wright (ed.) The Vision and Creed of Piers Ploughman (1842), 235-236. Modern translation by Terrence Tiller in Piers Plowman (1981, 1999), 123. Wenn sich für ein neues Fossil kein, auf eigenthümliche Eigenschaften desselben hinweisender, Name auffinden lassen Will; als in welchem Falle ich mich bei dem gegenwärtigen zu befinden gestehe; so halte ich es für besser, eine solche Benennung auszuwählen, die an sich gar nichts sagt, und folglich auch zu keinen unrichtigen Begriffen Anlass geben kann. Diesem zufolge will ich den Namen für die gegenwärtige metallische Substanz, gleichergestalt wie bei dem Uranium geschehen, aus der Mythologie, und zwar von den Ursöhnen der Erde, den Titanen, entlehnen, und benenne also dieses neue Metallgeschlecht: Titanium. Wherefore no name can be found for a new fossil [element] which indicates its peculiar and characteristic properties (in which position I find myself at present), I think it is best to choose such a denomination as means nothing of itself and thus can give no rise to any erroneous ideas. In consequence of this, as I did in the case of Uranium, I shall borrow the name for this metallic substance from mythology, and in particular from the Titans, the first sons of the earth. I therefore call this metallic genus TITANIUM. Martin Heinrich Klaproth. Original German edition, Beiträge Zur Chemischen Kenntniss Der Mineralkörper (1795), Vol. 1 , 244. English edition, translator not named, Analytical Essays Towards Promoting the Chemical Knowledge of Mineral Substances (1801), Vol. 1, 210. Klaproth's use of the term fossil associates his knowledge of the metal as from ore samples dug out of a mine. All sciences originated among the sons of Israel, the reason being the existence of prophecy among them which made their perfection in the sciences amazing. In Benzion Netanyahu, Don Isaac Abravanel, Statesman and Philosopher (1953, 1998), 100. Footnote gives: See Abravanel’s Comm, on Gen., io.i (f. 48, col. 4). The corresponding passage in Happoint ha-Happalah (Hebrew translation of Averroes’ Destruction of the Destruction, by Kalonymos ben David ben Todros, Bodleian Library, Michael Collection, Ms. 293, ff. 137b-138a) is somewhat different. Abravanel might have used the other Hebrew translation (MS. in Leyden) of Averroes' work (cf. Steinschneider, Uebersetzungen, pp. 333-4). Every son of science feels a strong & disinterested desire of promoting it in every part of the earth. In letter (3 Feb 1803) from Jefferson in Washington to Marc Auguste Pictet. Gauss was not the son of a mathematician; Handel’s father was a surgeon, of whose musical powers nothing is known; Titian was the son and also the nephew of a lawyer, while he and his brother, Francesco Vecellio, were the first painters in a family which produced a succession of seven other artists with diminishing talents. These facts do not, however, prove that the condition of the nerve-tracts and centres of the brain, which determine the specific talent, appeared for the first time in these men: the appropriate condition surely existed previously in their parents, although it did not achieve expression. They prove, as it seems to me, that a high degree of endowment in a special direction, which we call talent, cannot have arisen from the experience of previous generations, that is, by the exercise of the brain in the same specific direction. In 'On Heredity', Essays upon Heredity and Kindred Biological Problems (1889), Vol. 1, 96. I would have my son mind and understand business, read little history, study the mathematics and cosmography; these are good, with subordination to the things of God. … These fit for public services for which man is born. In Letters and Speeches of Oliver Cromwell (1899), Vol. 1, 371. If basketball was going to enable Bradley to make friends, to prove that a banker’s son is as good as the next fellow, to prove that he could do without being the greatest-end-ever at Missouri, to prove that he was not chicken, and to live up to his mother’s championship standards, and if he was going to have some moments left over to savor his delight in the game, he obviously needed considerable practice, so he borrowed keys to the gym and set a schedule for himself that he adhereded to for four full years—in the school year, three and a half hours every day after school, nine to five on Saturday, one-thirty to five on Sunday, and, in the summer, about three hours a day. If one might wish for impossibilities, I might then wish that my children might be well versed in physical science, but in due subordination to the fulness and freshness of their knowledge on moral subjects. ... Rather than have it the principal thing in my son's mind, I would gladly have him think that the sun went round the earth, and that the stars were so many spangles set in the bright blue firmament. Letter to Dr. Greenhill (9 May 1836). In Arthur Penrhyn Stanley, The Life and Correspondence of Thomas Arnold (2nd Ed., 1846), 277. And—which is more—you’ll be a Man, my son. In 'If', Rewards and Fairies (1910), 182. It is said that the composing of the Lilavati was occasioned by the following circumstance. Lilavati was the name of the author’s daughter, concerning whom it appeared, from the qualities of the ascendant at her birth, that she was destined to pass her life unmarried, and to remain without children. The father ascertained a lucky hour for contracting her in marriage, that she might be firmly connected and have children. It is said that when that hour approached, he brought his daughter and his intended son near him. He left the hour cup on the vessel of water and kept in attendance a time-knowing astrologer, in order that when the cup should subside in the water, those two precious jewels should be united. But, as the intended arrangement was not according to destiny, it happened that the girl, from a curiosity natural to children, looked into the cup, to observe the water coming in at the hole, when by chance a pearl separated from her bridal dress, fell into the cup, and, rolling down to the hole, stopped the influx of water. So the astrologer waited in expectation of the promised hour. When the operation of the cup had thus been delayed beyond all moderate time, the father was in consternation, and examining, he found that a small pearl had stopped the course of the water, and that the long-expected hour was passed. In short, the father, thus disappointed, said to his unfortunate daughter, I will write a book of your name, which shall remain to the latest times—for a good name is a second life, and the ground-work of eternal existence. The wind sweep man away. From dramatic poem, 'Empedocles on Etna', first published anonymously, collected in Empedocles on Etna, and Other Poems (1852). As quoted in The Contemporary Review (1867), Vol. 6, 344. Also in The Poems of Matthew Arnold, 1840-1867 (1909), 94. Our sons their fathers’ failing language see. In An Essay on Criticism (1749), 64. Note: first published anonymously in 1711 when Pope was 22 years old. When Science’s self destroyed her favorite son. Tributary verse eulogizing Henry Kirk White, whose death was attributed to fatigue caused by his long research work. Suppose it were perfectly certain that the life and fortune of every one of us would, one day or other, depend upon his winning or losing a game of chess. Don't you think that we should all consider it to be a primary duty to learn at least the names and the moves of the pieces; to have a notion of a gambit, and a keen eye for all the means of giving and getting out of check? Do you not think that we should look with a disapprobation amounting to scorn upon the father who allowed his son, or the state which allowed its members, to grow up without knowing a pawn from a knight? Yet, it is a very plain and elementary truth that the life, the fortune, and the happiness of every one of us, and, more or less, of those who are connected with us, do depend upon our knowing something of the rules of a game infinitely more difficult and complicated than chess. It is a game which has been played for untold ages, every man and woman of us being one of the two players in a game of his or her own. The chess-board is the world, the pieces are the phenomena of the universe, the rules of the game are what we call the laws of nature. The player on the other side is hidden from us. We know that his play is always fair, just, and patient. But also we know, to our cost, that he never overlooks a mistake, or makes the smallest allowance for ignorance. To the man who plays well the highest stakes are paid with that sort of overflowing generosity with which the strong shows delight in strength. And one who plays ill is checkmated—without haste, but without remorse. Address to the South London Working Men’s College. 'A Liberal Education; and Where to Find It', in David Masson, (ed. ), Macmillan’s Magazine (Mar 1868), 17, 369. Also in 'A Liberal Education and Where to Find it' (1868). In Collected Essays (1893), Vol. 3, 82. The science of government is my duty. 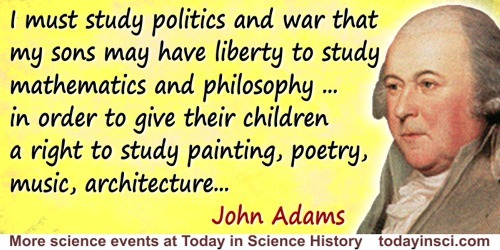 … I must study politics and war that my sons may have liberty to study mathematics and philosophy. My sons ought to study mathematics and philosophy, geography, natural history, naval architecture, navigation, commerce, and agriculture, in order to give their children a right to study painting, poetry, music, architecture, statuary, tapestry, and porcelain. Letter to Abigail Adams, (1780). In John Adams and Charles Francis Adams, Letters of John Adams, Addressed to His Wife (1841), 68. This tomb holds Diophantus Ah, what a marvel! And the tomb tells scientifically the measure of his life. God vouchsafed that he should be a boy for the sixth part of his life; when a twelfth was added, his cheeks acquired a beard; He kindled for him the light of marriage after a seventh, and in the fifth year after his marriage He granted him a son. Alas! late-begotten and miserable child, when he had reached the measure of half his father’s life, the chill grave took him. After consoling his grief by this science of numbers for four years, he reached the end of his life. Epigram-problem for age at his death (84). Original Greek with English translation in The Greek Anthology (1918), Vol. 5, 92-93. When I consider Thy heavens, the work of Thy fingers, the moon and the stars, which Thou hast ordained; What is man, that Thou art mindful of him? and the son of man, that Thou visitest him? Psalms VIII, verses 3-4, in The Book of Psalms: Containing the Prayer Book Version, The Authorized Version and The Revised Version: in Parallel Columns (1899), 8, Authorized Version column. Whenever I get gloomy with the state of the world, I think about the arrivals gate at Heathrow Airport. General opinion’s starting to make out that we live in a world of hatred and greed, but I don’t see that. It seems to me that love is everywhere. Often it’s not particularly dignified or newsworthy, but it’s always there - fathers and sons, mothers and daughters, husbands and wives, boyfriends, girlfriends, old friends. When the planes hit the Twin Towers, as far as I know none of the phone calls from the people on board were messages of hate or revenge - they were all messages of love. If you look for it, I’ve got a sneaky feeling you’ll find that love actually is all around. “Mother like son” is a saying so true, the world will judge largely of mother by you.